Ireland can be proud of the legacy of its priests and religious -- the overwhelming majority of whom have continued to serve their people in humble patience, with quiet devotion and outstanding generosity, the country's newest cardinal said yesterday. 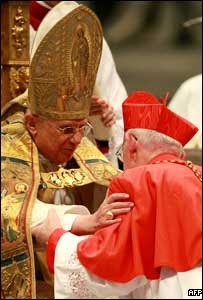 Cardinal Sean Brady, who is the first Cavan man to be made cardinal, was elevated by Pope Benedict XVI at a public consistory held inside St Peter's Basilica in Rome. The new cardinal, who referred to the traumatic times the Church had gone through in Ireland, said yesterday's ceremony was in a sense about the priests and religious of Ireland. "It is about the quiet acts of kindness, the supportive, prayerful presence in times of tragedy and disaster, the efforts to build community, and to bring dignity, comfort and hope to those in need. 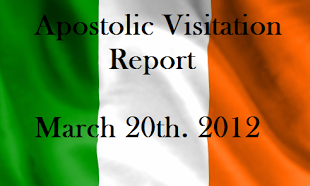 These have been the hallmark of generations of Irish priests and religious at home and across the world. It is a legacy of which, I believe, Ireland can be proud," he said. "Their generosity and commitment are recognised and celebrated in many parts of the world." He told those gathered in Rome that the years ahead will bring a new emphasis on the role of the lay faithful. "Respect for our neighbour, defence of the inherent dignity of the human person, generosity in service of others, concern for those most in need, especially in the developing world, turning the other cheek, going the extra mile, these are the things which have made Ireland the great, generous and peace making country that it is. These are the things that will keep Ireland great," he said. President Mary McAleese, who attended the ceremonies, welcomed the creation of a third Irish cardinal. Commenting on the possibility of a Papal visit to Ireland, Mrs McAleese said: "It's not for me to invite Pope Benedict to visit, that's strictly a matter of course for the Catholic Church. What I have said on a number of occasions is, that if the Irish Catholic Church was minded to invite him to visit Ireland, he would find himself very welcome and everything that could be done to facilitate such a visit would be done." The Taoiseach Bertie Ahern sent his congratulations to the new cardinal and paid tribute to his role in Northern Ireland and his work on behalf of peace and reconciliation.